The “Export Codebook” function allows you to automatically generate a Codebook – i.e. a category manual. The codebook lists all or selected codes in the order of the Code System and also outputs the associated code memo for each code. The completed Codebook therefore contains the category definition of each individual code, provided that this was recorded in the code memo. This saves a lot of work in the creation of the annex for a research report, especially since it provides the opportunity to unify the font for all memo text. The Codebook is created in RTF format and can therefore easily be opened with word processing programs such as Word. It includes a cover page with the title “Codebook”, the project name and the creation date. On the following page, the Code System is listed in a table. In the main section, the respective codes with their associated memos are listed in the order of the Code System. The Codebook function is accessed through the menu Reports > Codebook. A window will appear in which you can specify the Codebook options in more detail. In the top section of the window, you can specify which codes should be included in the Codebook. 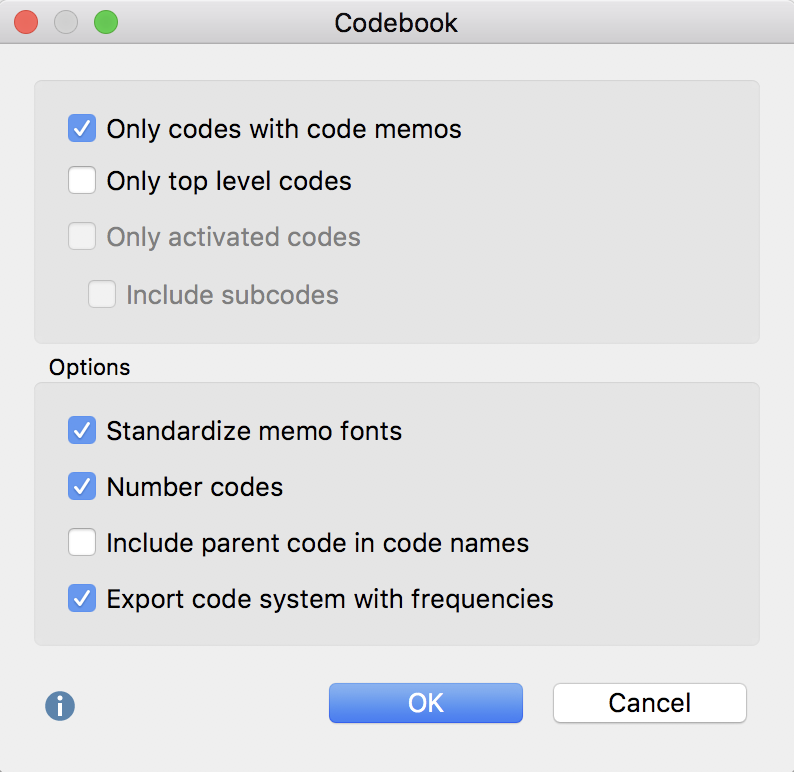 Only codes with code memos – Set this option to exclude codes that have no memo in the codebook. Only top level codes – If you select this option, only the codes in the top level of the Code System, with their associated code memos, will be included. Subcodes will not be included. Only activated codes – In this case, only activated codes will be included in the Codebook. You can decide whether (inactivated) subcodes should also be included: Include subcodes. This option is not available if you have selected Only top level codes. Standardize memo fonts – If the font, font size, etc. varies between memos, they can be uniformly displayed in the Codebook using this option. Number Codes – If this option is selected, the listed codes will be numbered according to their hierarchy in the Code System. Include parent code in code name – If this option is selected, the code path will be specified as a heading for the subcodes. Export code system with frequencies – If this option is selected, a column containing the code frequency will be added in the table overview of the code system. After confirmation, select a name and location for the file before the Codebook is created and opened.